Android 9 brings support for gesture-based navigation but current phones can choose to retain the conventional navigation buttons. While OEMs making Android One devices are still free to choose whatever navigation UI they deem fit, Google says that future Pixel phones will only feature the new gesture-based UI. The iPhone X's entirely gesture-based UI can elicit differing opinions — positive and negative — but that hasn't stopped Google from implementing it in Android 9 Pie. Since Android is all about choice, OEMs do continue to get the flexibility of choosing whatever UI suits best for their models. Google, however, will only be implementing the gesture-based UI in its Pixel phones going forward. That means, we will be seeing the upcoming Pixel 3 and Pixel 3 XL sport the iPhone X-esque all-swipe navigation with no option to bring back the older navigation buttons. The new UI is intuitive enough, though. 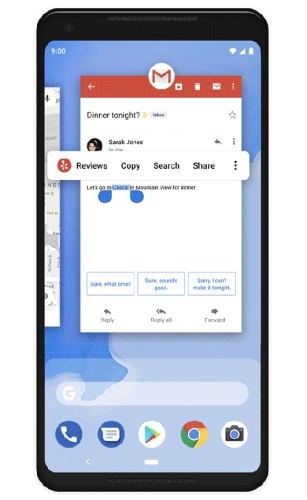 A swipe up from the home slider brings the horizontal scrolling recent apps screen, which also allows basic actions such as copy-paste without having to actually get into the app. Further swipe up brings the app drawer and the back button only appears when needed. The dedicated recent apps button does not appear in the new UI. While the upcoming Pixel phones will completely transition to gestures, it is also highly possible that future Android One smartphones will be joining the fray soon. Not all take a liking to replacing the home button with a gesture bar and for those who have been used to muscle memory to instinctively select dedicated navigation buttons, it will take some time to adapt to the new UI. Luckily though, OEMs still have a choice when it comes to deciding the UI so one can only hope that the user is given the choice.